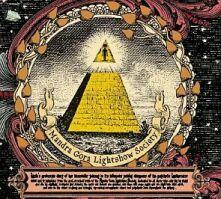 Mandra Gora Lightshow Society - "Lucile's Grotesque Diary Of... ( )... Psychotic Love Throughout The Galaxy"
This is the brand new release by Mandra Gora Lightshow Society. Most of the material on this CD has been previously released on vinyl only and rare compilations. The digipack is beautiful and features detailed liner notes about each song in German and English. There are a couple of tracks from the archives as well. The CD starts off with the two tracks from the great Space Rave picture disc 10" (limited to 1500), "Love Dies" and "Sweet Pain". Next up is a track called "Perry Rhodan's Smoke In Hallucination Theme", which was a left over from the Beyond The Mushroam Gate sessions. It is a funny organ based piece that only last 51 seconds! She said she went to art school because at home no one treated her like a princess (dedicated to Barbara Manning). It may sound familiar and that is because it is a new reworking of an older song that hs been in the bands live set called "Babushka's Spacephenomena". This is a really great 60's space rock track! "14th Cow" was released on the Swamp Rook Records singles club. A 60's pop number. Next is a cool cover of the Pink Floyd song "Point Me To The Sky", which appeared on the Swamp Room Happening 2000 compilation record. "Song Of Baker", a song intended for a Small Faces sampler, which was never released. I really love the guitar on this one! "Betty Day" is not the version from the Space Rave 10" but a newly recorded version. Put all space into a nutshell is a 8 minute song inspired by a James Joyce play and consists of 9 small sci fi inspired themes! "Big Store" is next and features Nikki Sudden with the band. This track appeared on one of the Ptolamaic Terrascope magazine compilation CDs. The band end the CD with a 15 minute long freakout recorded with Nik Turner at the German Hawkfan Festival in Hamburg (I was there!). A fantastic compilation CD and a must have if you are a fan of the band. For more information you can visit the Swamp Room Records webs site at: http://www.swamproom.de.